CATHIE, Bruce Leonard. Peacefully on June 2nd 2013 at North Shore Hospice, surrounded by his family. Retired airline pilot (NAC, Air New Zealand) and author. Beloved husband, best friend and companion of Wendy. Much-loved Dad of Stephen and Mark, and good friend to Jason. You’re free now to explore the universe in ways you have always dreamed. Be the light in your dimension. Forty-five years ago, Captain Cathie began his investigation into the World Grid® system. His initial interest was sparked by a sighting of an unidentified flying object over one of the local harbours in Auckland, New Zealand. He was immediately aware that there were machines, other than normally-known aircraft, moving through our airspace, which appeared to be more highly advanced technically than our own. As time went on, it became known to him that many other fellow pilots and radar operators around New Zealand were also sighting similar machines which were carrying out manouvres and flying at speeds that exceeded the capabilities of all known types of aircraft. It became obvious that either our own scientists had very advanced secret knowledge or we were possibly being visited by highly advanced beings from outer space. Later, as more information was received, it appeared that both these answers were possible. The captain commenced his own research project and plotted sighting positions onto an airways map which covered the New Zealand area and eventually discovered that a definite pattern emerged which indicated that the unknowns were under intelligent control. Several years later a complex geometric grid system was completed which covered the whole world surface. The patterns were eventually broken down into mathematical and geometric coordinates which could then be directly related to gravity, light speeds and the earth’s magnetic fields. From that point on the research developed at a faster pace and culminated in a series of unified equations and sets of unified tables which could be related to all branches of scientific research. A major breakthrough occurred when it was discovered that the mathematical base, which was harmonic in nature, could be related to the detonation of atomic devices. This fact indicated that all atomic activity was geometric in nature and that an all out atomic war was illogical. All detonation times and places could be pre-calculated by both sides in this type of war which virtually meant stalemate. It was after this fact was made known, that the research activity of Captain Cathie became noticed by certain governments and intelligence agencies. Tests were made of the knowledge held and the harmonic mathematical theories were then admitted to being correct. The research is ongoing and now, many years later, a computer program has been produced which carries out all the required calculations related to the light, gravity and earth magnetic field values. It has been found that many ancient building sites such as Stonehenge, the Great Pyramid, etc., show relationships with this unified harmonic mathematical system and indicates that the knowledge is not new. The civilizations at these times must have had scientific knowledge of a highly advanced nature. We are now in the process of relearning this lost science. If the discovered harmonic unified equations can eventually be accepted by the scientific community as correct, then we may be on the threshold of true space travel which has no barriers. The equations show that light speed is not a constant and that time itself is a variable. Under these conditions there is no place out there in space that we cannot reach. Obviously, there is more mathematical knowledge to be discovered, but it appears that the code has been broken. Soon, with a bit of luck, we on Earth may have the chance to join our neighbours out there in the vast blackness of space. Bruce Cathie – In or Out of Harmony? One summer evening in 1952, a young New Zealand pilot and several friends stood outside at an Auckland airfield watching what could only be described as a UFO. For Bruce Cathie it marked the beginning of a serious study of the phenomenon which has spanned the last 46 years. His work has led him to reach some startling conclusions, the publication of numerous books in support of his theories, and at the same time his findings have drawn the attention of leading scientists around the world. Cathie makes other claims, including the statement that scientists from a number of countries have already been conducting secret research for several decades using knowledge gained during the examination of crashed UFOs. He insists that governments have not only built similar craft but flown them. These clandestine experiments, based on the harnessing of gravitational energy, have served only to add to the increasing worldwide reports of UFO sightings by the general public. “I was taken into a laboratory and interviewed by scientists and afterwards they admitted that they were working in 15 dimensions. They can do all the things that a UFO can do,” revealed Cathie in a 1992 Radio Australia broadcast. “I think that we have already been on the moon before the moon landings and have gone into other dimensions,” he said. Cathie believes there are an infinite number of dimensions and that each is divisible by the same number as ourselves are in now. His research has led him ever deeper into the field of mathematics. “The whole universe is based on maths and this is how I became aware of what is going on around us, ” he remarked during the same radio broadcast. The success of his efforts, he reported, can be measured by the fact that the New Zealander had been contacted and was actively being visited by scientists engaged in similar work. “I was not aware I was finding out anything specific until being visited by these men, then I realized I must have been doing something important,” Cathie revealed. “Tesla himself was setting up a system for free world energy when he died, and this is one regret. People at the top have suppressed it. The knowledge is so advanced there would be a financial collapse around the world,” he maintains. Stung by both ridicule and criticism, Bruce Cathie was once asked to prove his claim of being able to predict a nuclear test. “I found that a bomb has to be detonated on a geophysical point at a particular time,” he said. 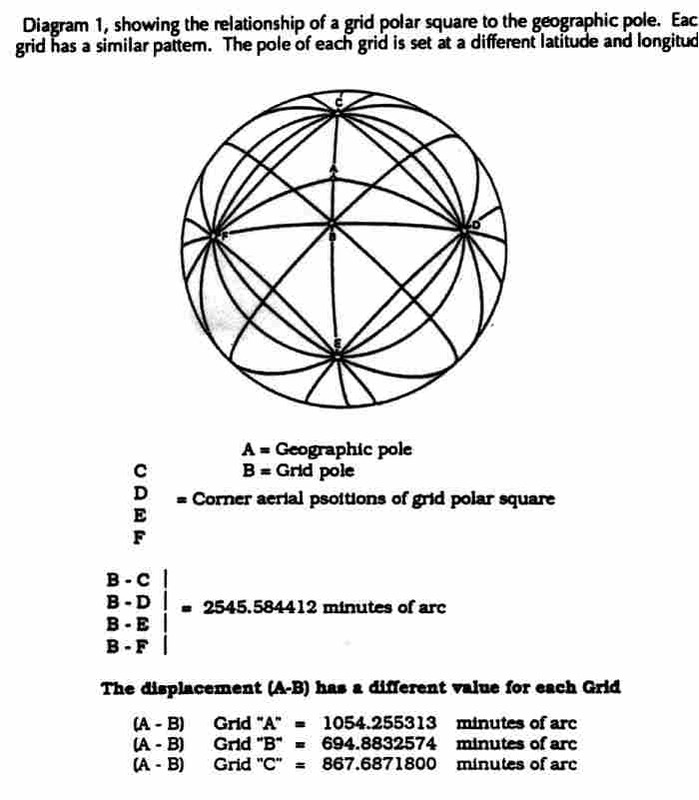 His reasoning for this relates to his claimed harmonic lines of force [see the work of Carl P Munck, Michael Lawrence Morton etc elsewhere on this website], or the geophysical position of the sun in relation to specific points located on the earth’s surface. Calculations carried out by Cathie led him to forecast the exact time a French nuclear test would be carried out on a remote atoll in the south pacific during 1968. Armed with his theory and mathematical knowledge, he then determined that the geophysical points of Nagasaki and Hiroshima in relationship to the sun matched precisely the timing of the American atomic bombing of these two Japanese cities at the end of World War II. Cathie believes that it is not possible to simply conduct a nuclear explosion at any time and at any point on the world’s surface, without carefully calculating the relationship between the sun and the earth. To bolster this claim he reports that the U.S. trained its bomber crews to drop their payload in 300 foot circles for three months prior to the actual attack on Japan. “They [the bombs] could not just be dropped anytime. Everything had to be accurately calculated,” he said. He aroused worldwide interest after first postulating the existence of a worldwide electromagnetic grid pattern, directly associated with UFO sightings. In a number of published works, Cathie has carried his researches many stages further, demonstrating the grid and its powers are already known to and being used by the ‘atomic nations’. He claims, because of this fact, the test facilities have to be precisely positioned on the geometric grid.